On January 31, 1939, President Franklin D. Roose­velt held a closed-door meeting with the Senate Mili­tary Affairs Com­mit­tee at the White House. Reportedly FDR made the com­ment that “the frontier of the United States is the Rhine,” meaning France’s east­ern border with Nazi Ger­many. When the state­ment was leaked to the press, the hub­bub in America’s iso­la­tionist circles was deafening. The pres­i­dent denied having made any such state­ment, calling the news­paper article “100% bunk.” How­ever, one month after the out­break of war in Europe in Sep­tem­ber 1939, Roose­velt was in a much stronger posi­tion to define the coun­try’s east­ern frontier vis-à-vis the isola­tionists and those who favored com­plete U.S. neu­trality, al­though the Ameri­can fron­tier was no­where near Europe. On this date in 1939, as Great Brit­ain and Nazi Ger­many fought each other for con­trol of the trans­oceanic pipe­line to and from the British Isles (Battle of the Atlantic), Roose­velt declared a region of the Atlan­tic adja­cent to the Ame­ricas as the Pan-Ameri­can Secu­rity Zone. Within the zone, which in­i­tially ex­tended from 300 to 1,000 nau­tical miles off­shore, all hos­tile actions by bel­li­gerent powers—meaning Nazi Ger­many and Fas­cist Italy—were for­bidden. U.S naval and air pat­rols escorted and actively pro­tected con­voys sailing to and from Europe with­in this neu­tral zone, even broad­casting un­en­crypted U‑boat sightings, which could be inter­cepted by Brit­ish war­ships. Naturally, sha­dowing U‑boats and broad­casting their loca­tions in­cur­red the resent­ment of the Ger­man Kriegs­marine, alarmed over Amer­ica’s warped sense of “neu­trality.” On April 18, 1941, Roose­velt ex­tended the Pan-Ameri­can Secu­rity Zone by another 1,300 nau­tical miles (altogether 2,300 nau­tical miles from New York) to a point just short of the mid-Atlantic Danish depend­ency of Ice­land, a major trans­atlan­tic con­voy staging area. The gap in the zone was closed when Ice­land severed its rela­tion­ship with the mother country and per­mitted the U.S. to garrison the island in July 1941. Left: After the German invasion of Poland on Septem­ber 1, 1939, Presi­dent Franklin D. Roose­velt imme­di­ately declared Amer­ica’s neu­trality. Four days later the U.S. organ­ized a so-called Neu­trality Patrol, con­sisting of naval and air units whose mis­sion was to track and report the move­ments of any war­like opera­tions of bellig­erents in the waters of the West­ern Hemi­sphere. 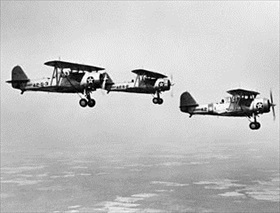 In this 1940 photo U.S. Navy Vought SBU‑1 Cor­sair dive bombers fly the Neutrality Patrol near Norfolk, Virginia. Right: A U.S. Navy Vought SB2U Vindicator scout bomber from the U.S. air­craft car­rier Ranger flies anti-sub­marine patrol over a con­voy en route to Cape Town, South Africa, November 27, 1941. 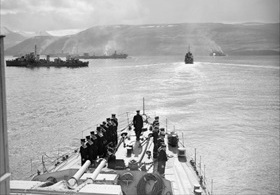 Left: Escorts and merchant ships at the Hvalfjord (Hvalfjörður) naval base, Iceland, late June 1942. During the World War II nearly one third of the world’s mer­chant shipping was British. Out of 36,000 mer­chant sea­men who lost their lives between 1939 and 1945, over 30,000 were from the Brit­ish Mer­chant Navy. More than 2,400 Brit­ish ships were sunk out of the total of 2,900 Allied ships lost, or a loss of 14.6 mil­lion gross tons. A little over 9,500 U.S. mer­chant marines died at sea, in POW camps, or of their wounds out of the roughly 243,000 who served. (The U.S. govern­ment never kept accu­rate records for its mer­chant marine.) Most of the ships sunk during the Battle of the Atlan­tic were not in con­voys, but sailing alone, or having become separated from convoys. 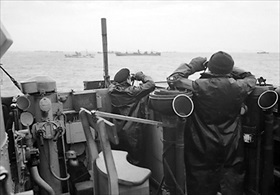 Right: Officers on the bridge of an escorting British destroyer keep a sharp look out for enemy sub­marines, October 1941. 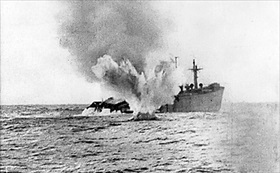 Left: An unnamed U-boat shells a merchant ship that had remained afloat after being tor­pe­doed (no date). The focus on U‑boat suc­cesses, the “aces” and their scores, the number of con­voys attacked, and the ships sunk obscures the fact that during the Battle of the Atlantic only 10 per­cent of trans­atlantic convoys were ever attacked, and of those attacked only 10 per­cent on average of the ships were lost. Over­all, more than 99 per­cent of all ships sailing to and from Great Britain during World War II did so safely. 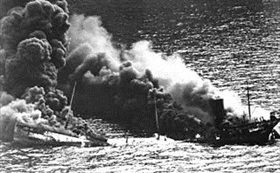 Right: The 8,046-ton U.S. tanker Dixie Arrow was torpe­doed by U‑71 on March 26, 1942. The ship is shown crumbling amid­ships under the heat of fire. 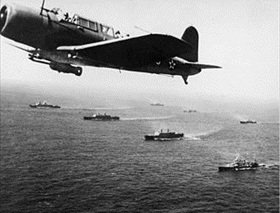 Between June 1, 1941, and May 31, 1943, the U‑71 carried out ten war patrols. Operating out of the huge U‑boat pens at St. Nazaire, France, U‑71 on her fifth foray sank 38,894 tons of shipping between March and April 1942. She sur­vived com­bat duty to be scuttled on May 2, 1945, in Wilhelms­haven, Germany, several days before the country’s surrender. Left: A Royal Navy, Fleet Air Arm Grumman TBF Avenger fires its machine gun on the con­ning tower of U‑288 during a con­voy run to the Soviet Union, April 3, 1944. 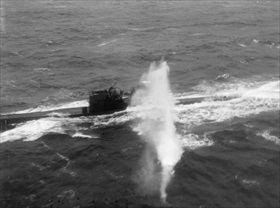 The U-boat was even­tu­ally sunk by roc­kets and depth charges. Forty-nine men died; there were no sur­vivors. The Kriegs­marine lost a total of 783 sub­marines and 30,000 sailors during the war. Despite their best efforts, Ger­man sub­marines failed to stop the flow of stra­te­gic sup­plies to Brit­ain. Between existing Allied mer­chant ships, U.S.‑built Liberty ships (totaling 38.5 mil­lion tons), and British-built Empire ships, the Allies launched mil­lions more ship tonnage than the 14 mil­lion tons of shipping lost to the U‑boat menace. 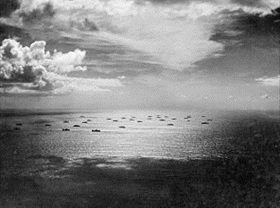 Right: At the height of the Atlantic cam­paign, U‑boats failed to hinder or even detect the U.S. inva­sion fleet headed to North Africa in Novem­ber 1942 (Opera­tion Torch), and they failed to pre­vent the build-up of troops and supplies needed for the D-Day landings in June 1944. As early as May 1943, when a fifth of his U‑boats was sunk in “Black May,” Grand Admiral Karl Doenitz conceded that Ger­many had lost the Battle of the Atlantic.